I made this mini bag with 11"x 8.5" card stock. Love these boxes!! Thanks for showing us how to make them too!! 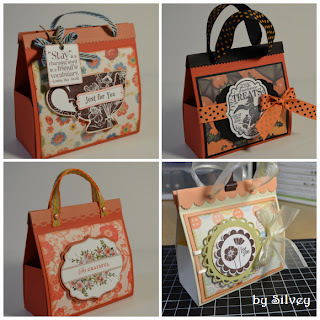 I will be featuring them on My Crafty Picks #74 with a link back to your blog on 8-19-12. Make sure to stop by to check out all the picks and to pick up your blog badge to display on your blog for being featured!! These are adorable! Do you have directions, or measurements for the folds?? 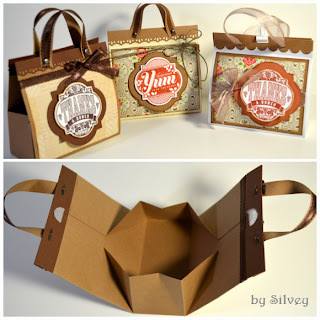 Thanks for sharing these great boxes and good luck with your new blog! Don't forget to include your links and Demonstrator contact info too. Hopefully this blog will help you with your SU business. Take care. So Cute! Congrats on being a Crafty Pick! This is great! Your projects are beautiful! You Rock! Are the fold measurements available? These are so darn cute. When I open your tutorial, I can't see the last number you posted in the first slide. It is covered up by the comments on the side of your blog page. Could you post the last number please? Your bags are just adorable! I would love to make some. Can you please post the measurements? These are wonderful. Can you post a tutorial for the boxes. I would love to make them. Thank you so much. Merci pour le partage de vos créations. Would u please post a link where we can find the cute labels you put on your bags? Thanks! Love it! Oh my! These are just so cute. I will have to try making these bags! Thank you for sharing. These bags are adorable! Great timing with Christmas around the corner! I had to 'translate' in cm and I made the bag, thank you for sharing!! THANK YOU! merci c'est très gentil et très beau. Bonne Année. 3/4, 4 1/2,6 1/2 and 10 1/4 are the score lines. Fantastic blog! I don't think I've seen all the bags of this subject the way you've pointed them out. I love seeing websites that realize the value of providing a quality information. Thanks for sharing this! Thanks for sharing the tutorial. Very cool! Leather Hand Bags- Buy Expandable Canvas Leather Bag in Just 2,200 Rs Only, Heavy twill canvas body provides a Good structure to the bag. mag ik soms vragen hoe dat je dat maakt. Where can I find directions on how to make these? They are wonderful! I just wanted to say these are just gorgeous...I have made them for a Retreat I am attending at the end of the month. I have linked you to my fb page. COULD I PLEASE HAVE THE DIRECTIONS AND MEASUREMENTS FOR THIS BAG.....I JUST LOVE IT!! Too cute! My Anything but a Card Club will love this. TFS. This is so great! TFS! I made one this morning and I love it! Totally adorable and pretty easy once you get the one fold done. Thanks for this! Wonderful tutorial! I loved it. I love handbags. I have bought Discount Coach Handbags and will surely try to make this one too. Thanks for sharing. so nice!! thanks for sharing with us! I would love to have the directions for this bag. I realize this is a couple years old. Is the tutorial available? Alguien sabe si hay un vídeo tutoríal o pueden mandar las medidas en centimetro?? Xfavor!! Thanks for the post, your blog contain a very nice and different information about the bags that's are very nice. That's a different idea and it is fashionable good looks and make them look perfect. He said that a total of 500 selected teachers and officials were being awarded based on set criteria and 95% of the awardees are teachers and the rest are managers and administrators. Thank you for this post! Since I am new to stamping and card making and all things paper this was a challenge for me, but I did it! It just took a little more looking and looking and looking. As from the posts of 2012 to now, 2019, this is a timeless item to make. No one would be unhappy to receive this. Love it. When you pull the box the card will come out together.